Just after noon, June 1, 1791, from the elevation to the south, now known as "High Gap", Brigadier General Charles Scott, his 33 officers, and 760 mounted Kentucky Militiamen rode toward the smoke of cooking fires rising four miles to the north over the principal town of the Ouiatenons (Weas). After the Revolutionary War, Ouiatenon, a fortified century old trading town, became a rendezvous for Wea, Kickapoo, and Mascouten Native Americans conducting raids against American settlements along the Ohio and Kentucky Frontier. The Wabash towns and their Miami and Shawnee allies on the Maumee River, were subject to continuing British encouragement from Detroit to violently resist American encroachment into the Northwest Territory. In March, 1791, peace efforts exhausted, President George Washington reluctantly ordered Secretary of War Henry Knox to direct a punitive raid against the Wea, using the Kentucky militia. Scott's force mustered near Cincinnati, then marched 160 miles to Ouiatenon in 8 days. Upon arrival, they engaged the several villages comprising the Grand Ouiatenon. An unmounted detachment of 350 men, under the command of Lt. Colonel James Wilkinson destroyed the important town, Kethtippecanuck, near the mouth of the Tippecanoe River. 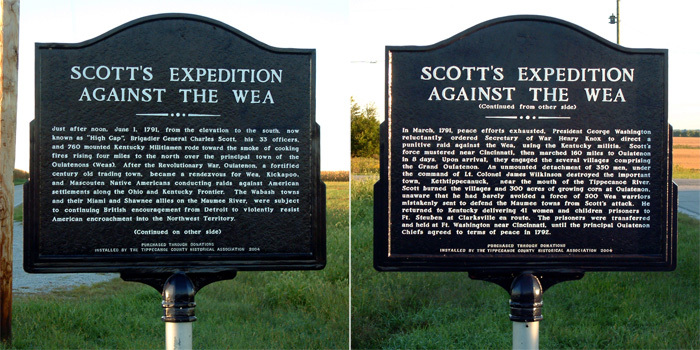 Scott burned the villages and 300 acres of growing corn at Ouiatenon, unaware that he had barely avoided a force of 500 Wea warriors mistakenly sent to defend the Maumee towns from Scott's attack. He returned to Kentucky delivering 41 women and children prisoners to Ft. Steuben at Clarksville en route. The prisoners were transferred and held at Ft. Washington near Cincinnati, until the principal Ouiatenon Chiefs agreed to terms of peace in 1792.